My new collection: Gods, Guns & Robots is Now Available! 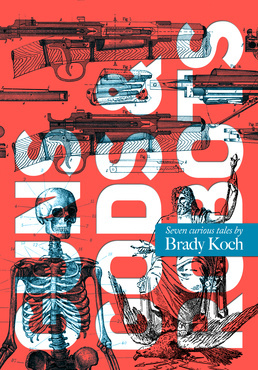 Brady Koch's new Story Collection Now Available! My first collection of stories and novellas is now available to download through Amazon. The majority of this work is published here for the first time and includes seven tales that will alternately uplift and horrify. The three returning stories have been "remastered" and worthy of revisiting. Sure to spark your imagination, Guns, Gods & Robots will also keep you up at night. 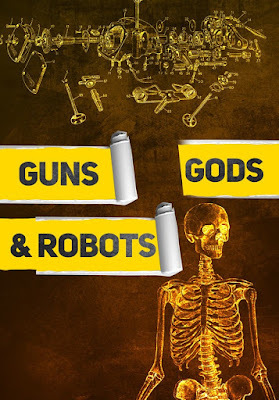 As a bonus, readers enrolled in Kindle Unlimited will be able to read Guns, Gods & Robots at no cost through the end of March. But wait, you aren't in Kindle Unlimited and want to read my book for free? See below. 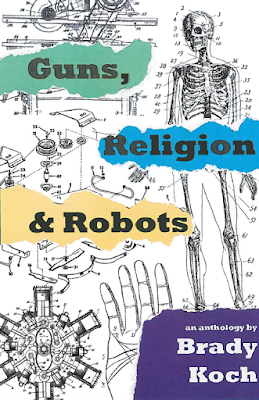 . .
Download Guns, Gods & Robots here. To reward loyal readers, I'm hosting a simple grassroots campaign that is fun and results in YOU getting a FREE copy of GGR. 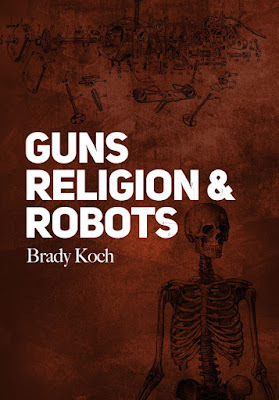 For a LIMITED TIME, anyone posting one of my marketing flyers and sending me the photo through Twitter will get a free digital copy of Guns, Gods & Robots. To demonstrate how the three older stories have been "remastered," I'm cycling Numbers 16:32 and X-mas For a Half-Life off of OpenBooks.com and NoiseTrade and replacing it with the refreshed version of Popular Mechanics For Young Widows. As Tyson says, ENJOY. Playing in @FanBridge so I can announce something very special in the days ahead. Some astute people on Amazon have already figured it out. Short stories, flash fiction, writing notes and more! This was some fun flash with a 150 word limit for @SalnPage. A tricky prompt indeed. Mr. NUI scrubbed harder to wipe the spraypaint off the wall. His spraypaint. He brushed vigorously enough for it to look like tough work for his investors: codgers who would be watching this footage on tonight’s news. 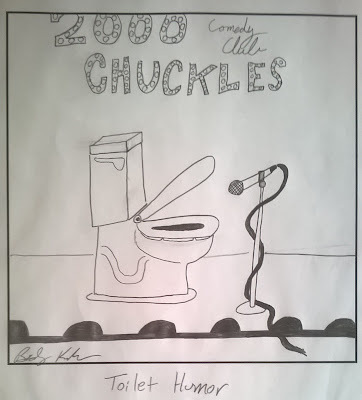 His true fans could get a good laugh in when re-watching the videos online in the months ahead. He never wore a mask for his graffiti work, but all the papers and websites were quick to use the lazy headline “MR. NUI UNMASKED.” His followers likely had an image of him as a mysterious, globetrotting, renegade, not the overweight, pasty man that was arrested halfway through his firehouse umbrella girl mural. 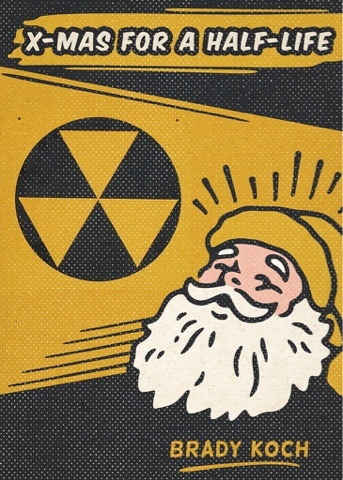 I had some fun writing a little Christmas story just in time for the holidays. I've posted it on OpenBooks so you can download, read and forward to as many people as you like. I've had a busy schedule lately, but happy to get back into the #FlashMobWrites mix. “I broke it down into people’s consumption by weight and goal weight.” Jimmy scrolled through screens and screens of charts, raw data and pivot tables comprised of March’s total data from their calorie tracker application. Now that he was in charge of their little company, Bryant didn’t get to play with the data as much would have liked. He was stuck working with selling their insight to food companies. The ads in their App were pennies compared to the shopping habits living in this data set. “Just look at it go up like that,” Bryant said, tracing his finger up the curve to the apex of the spike. “No. It’s worse,” Bryan said, holding out his phone. Jimmy skimmed the article from the Woonsocket Call, the local newspaper. QUESTIONS REMAIN: WHERE’S KIMBERLY JEFFERSON? Apparently the Kimberly in question had disappeared in the past month leaving only three fingers behind. Sad to learn Flash! Friday is coming to an end. 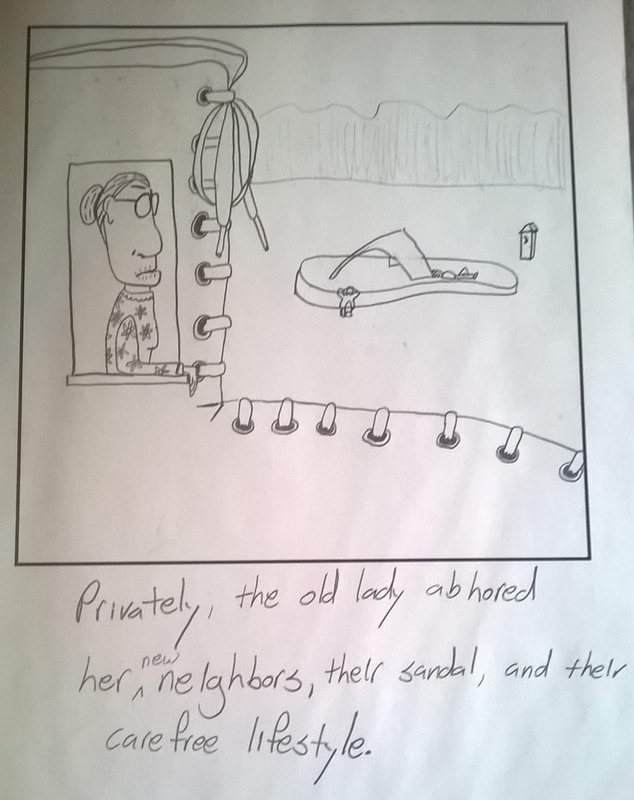 This week's prompt was inspired by One Hundred Years of Solitude. The vine was very basic, yet Bernardo took painstaking efforts to draw every feature of the specimen in his journal. On his trips throughout the Pacific in the last decade, he’d had the chance to draw and catalog the flora of dozens of islands. His work had been collected in Universities and studied by young botanists and scholars. 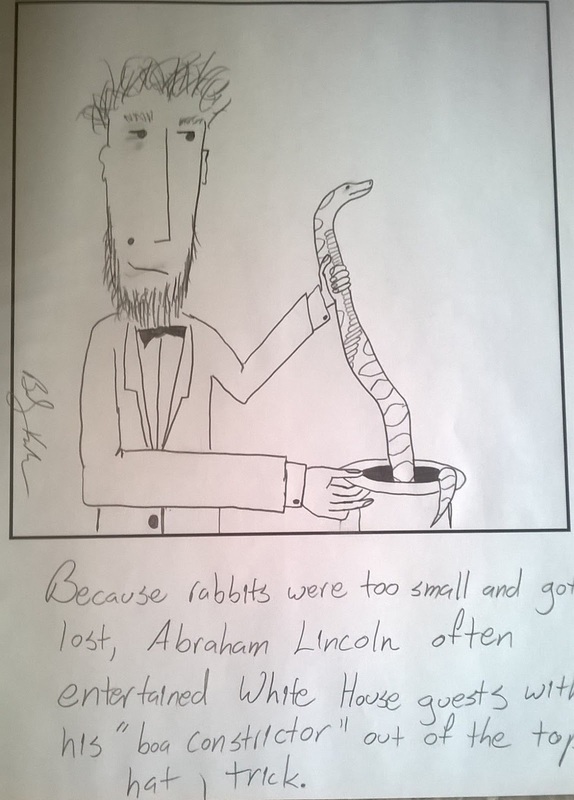 Yet here he was, home at last, drawing this vine just like he had as a child. This plain green leaf whose only claim of prominence was that it grew out of the long-picked skull of the artist’s father. 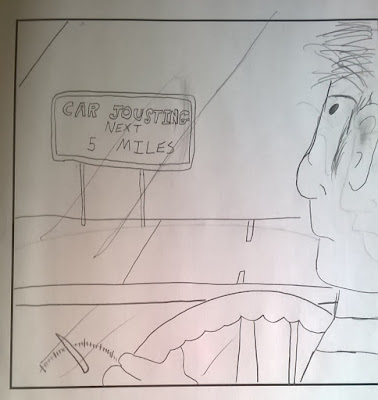 Bernardo considered drawing his father’s skull in addition to the vine. Or the knife sticking from the rib cage. Just where Bernardo had placed it all those years ago when father refused to let his son leave the plantation. He shrugged off the thought. The plants deserved documented for future generation’s study. His father did not. A Gone With the Wind style prompt for this week's Flash Friday. In the mold, the bullets were lined up side to side, tip to tip. Like the ships that father told him about. The ones that brought him here. Hardly space to breath, no space to move. The ammunition was identical to the hundreds of others Justin’d made this week alone. The plantation seemed to have a never-ending supply of metal to scrap. With the setting sun, the makeshift metalworks looked like the fires he’d been using to melt down the remains of Master’s house. Justin was pleased he’d been able to overproduce these bullets for the quartermaster’s weekly pick-up. Not that he would avoid another whipping, but that they would be used by Master’s sons in the field of battle. Would they know their ammunition was made from the ruins of their inheritance? Would they know that each bullet was guaranteed to misfire and destroy the gun because of the strategic changes Justin had made to the mold? I was happy to place first last week, so taking another stab at #FlashMobWrites. Evelyn was tired of hearing about Henry’s beard at church every year. “He looks just like Jesus,” she’d overhear. And, “Oh my, it’s like he walked right out of the bible,” they’d say. Completely ignoring that the man had the acting ability of a mannequin and paraphrased most of his lines despite them being clearly laid out for him, in red no less. Her son Marcus could grow facial hair twice as full and twice as fast, yet he never got the admiration of the congregation like Glenda’s child in the Easter Passion play. Nobody walked up to the two of them in the social hall after the play. The devil never got thanked. The children and adults all gathered around Henry, while Glenda winked at them from her son’s side. Evelyn always pretended to look just beyond her rival, to avoid giving her the satisfaction of accepting her acknowledgement. She knew the beard wasn’t the reason Henry got to play Jesus each year over the past decade, it was his mother’s deep contributions to the offering plate. Marcus ignored his mother’s continued complaints at the dinner table and honed his role year over year. His sinister presence on the makeshift pulpit stage commanded the audience more than Henry ever did. “All these things I will give You, if You will fall down and worship me,” he sneered. It was all Evelyn could do not to clap in the moment he delivered the line. In that moment she forgot about the clippers she’s been secreting in her lap with the intention of finally evening the playing field with Glenda. In her whole life she had never imagined rooting for the devil, until she learned her son played the part so well. “C’mon ma, you’d be perfect for the show. I told you about the pay, right?” Carlo stared his mother down trying to dial up the insistence in his voice more than the dozen or so other times he’d had this conversation with her. He knew she’d take the papers from him pretend to look over the waivers from the production company then stack them up wherever she stacked the rest of these printouts in her capacity house. “I’m just not the on camera type,” she offered again. “They’re just here for the week. Enough to clean out all this hoarding mess and get you a new start.” And give each of us five thousand for participating, he added to himself. “Ma, one stray spark from the stove and this whole place goes up. Don’t be surprised if that happens.” The floors were stacked with newspapers. The piles reached the ceiling. The whole house reeked of them. Now Carlo reeked of them too. His wife would complain about it, but he couldn’t afford to dry-clean the smell out. Not after the layoff. Carlo sighed. He couldn’t push her too hard. This all started when Dad ran off two decades ago. She collected the papers hunting for any sign of him in the news. He was certainly in the news before then. Mainly the police blotter. Always telling his kids he needed to get what’s his. Minor crimes. Petty theft. Larceny. Nothing violent. Ma was the violent one, but only to Dad. Carlo didn’t blame the man for leaving her. He never did come up in the papers though and the papers never left. They just stacked up. Ma was able to collect his insurance policy about five years after he was gone. Somehow she was able to get him declared deceased. Now the money was running out and Carlo was also in a pinch. The Hoarding reality show was a sure thing. Easy money. “I’ll look over the application.” He could tell she had no intention of doing that. “All right.” He gave her a kiss on the head. Even her skin exuded the stale paper smell of her domicile. He made his way through the foot-wide cleared path of paper back to the front door where the newspaper stacking had started. He’d get her to sign the papers. The five thousand for himself was only the beginning. He knew he’d get much more with the press tour in the aftermath of what the film crew would find under Ma’s piles. He was certain Dad was under those papers somewhere, Carlo just had to wait it out. He’d known for a while, but like his Dad, he had to wait for the opportunity to get what’s his. This week's Flash Friday prompt was about the core story elements from Pride and Prejudice. The birdbath next to the gazeebo would have to do. In fact, Beatrice could think of no better place for her work under the moonlight than the garden where her daughter had first laid eyes on this new suitor. Not that James has met her gaze with kindness. Gentle Priscilla was every bit as reviled as her mother and twice as dour. Yet when her daughter came to her, set on making this man her own, what’s an old witch to do? As she dropped the dried herbs, locks of hair, leathered animal skins into the stone basin, she moondreamed of being the mother of the bride at the inevitable wedding. The whole village would talk about the young aristocrat who’d inexplicably given his heart to the crone’s offspring for lifetimes to come. Setting the contents of the birdbath ablaze, Beatrice practiced smiling, wanting to meet the wedding guests with the toothiest grimace her ramshackle mouth could contort. Confirming the last steps of her recipe, she tucked the parchment back into her satchel. She poured the soured milk, vial of blood into the ash and started making a poultice. She knew better then to attempt this recipe by heart. The last time she endeavored to craft love potion for her daughter by memory, she’d only been able to produce a highly effective poison. Frankenstein's Creation stopped, defeated. Efforts with the Monster Truck would never birth the progeny his second-hand heart desired. Amos tossed his latest trophy in the laundry bin atop the others. The basket was overflowing with pilfered wigs. He almost had enough. Otis limped to the bookie counter to place his bet. 10th time had to be the charm. One more loss and they would move on to his fingers. Officer Nim poked the wet pink mass with his shoe. It even smelled like 200lbs of chewed bubblegum. Was it performance art or homicide? Another clump of hair came off in her hands. The pills worked. At this rate she'd assimilate with the aliens before all of her friends. How did this severed toe fall from its silver platter at last nights soiree? Nosferatu had no qualms about breaking the 5 second rule. He shook the remaining gelatin-x5 from his hands. Descending the water tower, he hoped everyone would enjoy the world's largest jiggler. The blood on the glass wiped clean. He pushed the screen on his iPhone and felt the pressure again. Something inside was touching back. It was work grandfather had started. A photo a day of the bronze statue. Viewing the decades in sequence was proof that it was alive. He guessed the odds of finding his bag in the landfill. 1:1M. Better odds than the winning lotto ticket he mistakenly tossed last night. The #PHL police were skeptical. The @AmTourister was identical to the one he'd checked at #LAX. Except for the stolen Picassos inside. The suitcases were tiny. Matchbox-sized. Tiny clothes were inside. Alongside tiny knives. Whoever brought these was planning to stay. Saving the tangerine for a year finally paid off. Kentucky slid the withered fruit perfectly into the tube. Opening the box was an awkward reunion. Although the toupee was made of his own hair clippings from 20 years ago it didn't look right. Picking his teeth with the rib bone, Louis had few regrets. He'd let his starvation make the decision to eat the dodo. He shook the Polaroid waiting for the image. He had captured the bigfoot's shadow. Pausing the VHS at the exact spot again was unlikely. Ms. Deagle screamed realizing her motorized lift was paused by the cats' paws on the strange post the small green carolers had delivered. The sunlight above was dim enough to read the gauge on his faulty Scuba tank. Doomed, he paused to question if he still had his receipt. I'm really happy with the final cover design on Guns, Gods and Robots, and want to revisit all of the drafts it took to get to the final product. After loving his work on Numbers 16:32 and Popular Mechanics for Young Widows, I reached out to @1ndika and gave him my mockup of what I'd like along with some early guidance from Cover Critics. @1ndika sent this back my way with his own ideas for color scheme in line with our first two collaborations. I liked this, but wanted to try out the tear away concept and add some more pop colors into the mix. The stories aren't all horror, so I thought we need to lighten it up.You can also see I made a title change as I was continuing to assemble the collection. I liked the colors, but at this point had cut two of the horror stories from the anthology to focus more on unpublished material. I asked @1ndika to again punch up the colors and abandon the tear-away concept. This draft got me excited so we agreed to fill it with all sorts of diagrams for additional story components and added a splash of blue to the front. Again, I'm really happy with @1ndika's final product and think it fits right in with the tone and content of this collection of weird tales. This' week's challenge prompt was a simple b&w image of a audience. The woman in the second row screamed and broke the tension in the room. The small audience in the theater got louder watching the man in the glass tank struggle against the chains wrapping his wrists and ankles. “Flash” Terry had told the audience he would be out of his bindings and open the padlock from the inside of the tank in under two minutes. The stopwatch clutched in Byson’s hand revealed that the magician on stage had been submerged for three minutes so far. Byron yawned. Terry could easily hold his breath for four minutes. 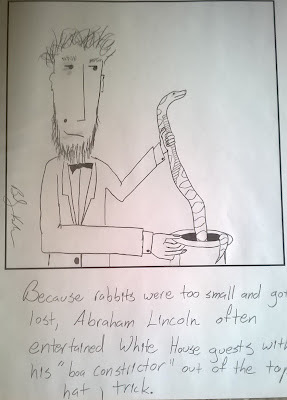 That was what Byron ‘The Gentleman Mystic” did in his own version of this act. The very one Terry had stolen and was attempting to recreate on stage. The audience burst into applause as the man in the tank loosed his arms and started pulling at his feet. He’d surely be freed soon. Terry had no love for the craft of illusion, only a passion for the stage. The audiences Byron once thought appreciative of his decades training his hands, reflexes and mental dexterity quickly dwindled, preferring Terry’s penchant for theatrics, crass humor and lesser versions of other illusionist’s acts. Four minutes in and Terry’s feet were free. Inside the tank, he was twisting the key he’d concealed in his gums into the lock. Now able-bodied men were being asked to come on stage to attempt to smash the tank open. Byron doubted that would help. Terry had copied Byron’s design for the chamber down to the last detail. The clear box was impenetrable. The key would be Terry’s only salvation. Unfortunately, the key in the tank was worthless. The one Terry needed was now in Byron’s hand and the old magician had decided this would be the thief’s final performance. 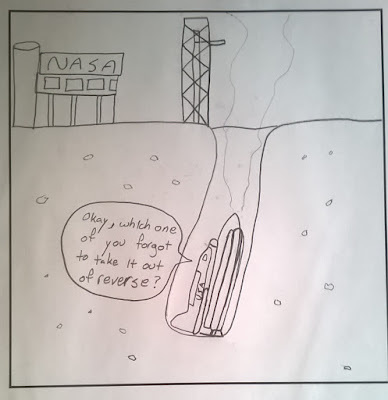 I found some notes next to this cartoon that had this guy's whole routine. If I was brave, I'd try the exact routine at a local open mic and see what happened. The layout of this guy's car bother's me. It kind of looks like he's in one of the driving simulators we had in high school. In two weeks you'll be able to download my first collection of novellas, and short stories. Look for more information on the weird, horrific, and unusual stories leading up to publication. Big thanks to @1ndika for designing my favorite cover yet. 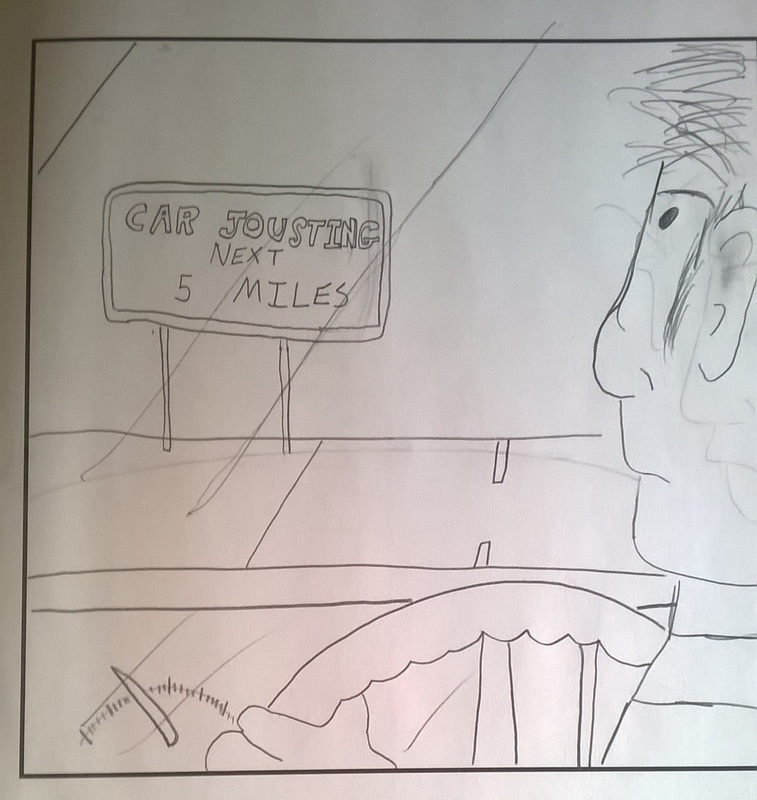 Another in the series of re-discovered attempts at comics-making. 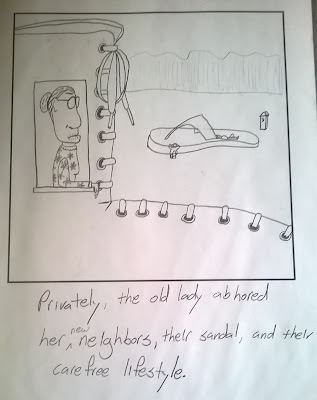 I was cleaning out the garage in preparation for a big move and uncovered a series of comics I made in college in an attempt to emulate one of my favorite storytellers: Gary Larson. Needless to say this didn't take off and there's no need for Mr. Larson to come out of retirement any time soon. This week's challenge was a prompt of a shark bursting from a brick wall. Once more I resume my pen to write you a few lines, it was with pleasure that I learned that you had had such a pleasant time at the salt water. I write not to tell you of an act of bravery performed by myself but of an act of defiance. It is best you hear of it from your loving son than from Gen. McLean’s emissaries. The young man delivering this note was finely paid so feel no need to further reimburse him. If he requests more, he reveals himself to be the duplicitous sneak I suspected him to be. Alas, in my situation, I could find no other willing party to transit this letter. To explain the charges against me. . . More hard fighting had been going on across the Virginia shores, there we escape again and again while others fall. Receiving a light head injury from a fall after a row with some yellow livered sympathizers I was placed on powder room duty. Was alone with our entire heavy artillery while my brothers-in-arms marched South. I had taken to the comfort of a large bottle of whiskey in my solitude at the fort. Always a curious sort, you know this from my childhood travails, I set to discover what would and would not fit into our largest cannon “Northern Glory.” Many things did not fit, but one unusual item did. The masthead remaining from a sunken merchant vessel. A trophy of sorts from an afternoon of shelling the ships on the ocean. The large wooden shark fit finely into Northern Glory. It is to my great dissatisfaction and current state of court martial that I found out the cannon was primed with powder. My lit cigarette provided the ash that provided the unwelcome flame and the wooden beast breached the fort wall quite easily. Flash Friday! This week was a tribute to 1984. The month’s list was perfect. A neat list of twenty new words on the right a longer list of fifty words on the right. Nobody ever paid attention to the longer list. The populace of Neo-Termina all wanted to see what new slang was would be added to the official lexicon list. They seemed to care less about the words that would have to be purged to make way for the new ones. The Office of National Lexicon had been tasked with thinning out the dictionary. Over time, it would help more children pass the federal standardized testing. Walter was the only librarian not to protest, in fact he’d actually been on PTO when the order came down. All of his peers had quit citing principles and integrity before he even got back from his lake house. He was great at his job. Walter’s first suggestion was to make the yearly change monthly. Then he just started scaling up the list of deletions monthly. With every change nobody noticed the expunged words. With the approval for his recommended addition of the hashtag to the lexicon his new words were simply variations on existing ones. Soon enough he knew he would be able to purge monthly without any need to add anything new to the language. Created another flash entry this weekend to take a break from novella editing. 350 word limit and a tea cup prompt. It always bothered Gladys that the ceramic canister looked so much like an urn. The shape, color and even the solemn weight of the thing gave her tea times a funerary feel. Over the past week she had to knock the container against its corner to collect enough of the powder to retrieve with her spoon. Her loose calculation only gave her about three more tea times with Harold before she’d need to fill the thing again from scratch. She dumped the chalky powder into her Earl Grey and gave it a mix. She couldn’t say it did much for the flavor, it was just a custom she liked to keep. First with Lyle, then Harold and at some point soon with Garret. She looked at the power in the canister again. She could see the bone white china peeking back at her through the now-limited cover of its contents. “No time like the present I ‘spose.” She took a sip from her team and returned the canister to the shelf. Gladys caught a glimpse of herself in the mirror. She smiled. Her teeth were immaculately white despite her continual consumption of tea. Not too bad for seventy-six, she thought. Further proof of the restorative power of the additive she was running low on. She didn’t know how it worked, but thought it had something to do with the abrasive nature of the minerals on her teeth. She reached back into the shelf for a smaller container. One that only she knew existed. The dried belladonna leaves, once shredded, looked identical to her and Garret’s beloved Earl Grey. He’d never notice the deadly substitution. Lyle and Harold certainly hadn’t. Another sip and Gladys had found herself at the bottom of her tea with Harold. As always, there was a small cluster of clumps at the bottom of the delicate cup. She lifted the cup and scooped the remaining bits of Harold’s cremated remains with her tongue. This week had a certain Roald Dahl theme. . . It's another week of Flash Friday. Had to include a writer and to me, the photo prompt looked like a prisoner. Everything in her hand trembled. Not from any fear of the prisoner laying on front of her. Like the others, he was strapped down at each limb and had his metal collar clamped to the table. The problem was the tattoo machine the state has supplied. Specifically the rear binding post that was loose and beyond repair. Each of her bones, tendons and fingertips shook after hours of operating her assigned machine on intake days. With the tingling in her fingers fading, she returned to this hour’s canvas. She’d already completed etching in his vehicular manslaughter conviction under the older, bluer possession charges tattooed higher up on his chest. She examined the victim’s list that came in with him. She checked the clock. She only had fifteen minutes to enter all five names underneath. It would likely be incredibly painful, especially since she had to go down to his abdomen. A yawn found its way up her throat and she bent over to start inking again. She has always wanted to be a true crime writer, but until she found a publisher willing to give her a chance this would have to do. Another Flash Friday entry for the week. 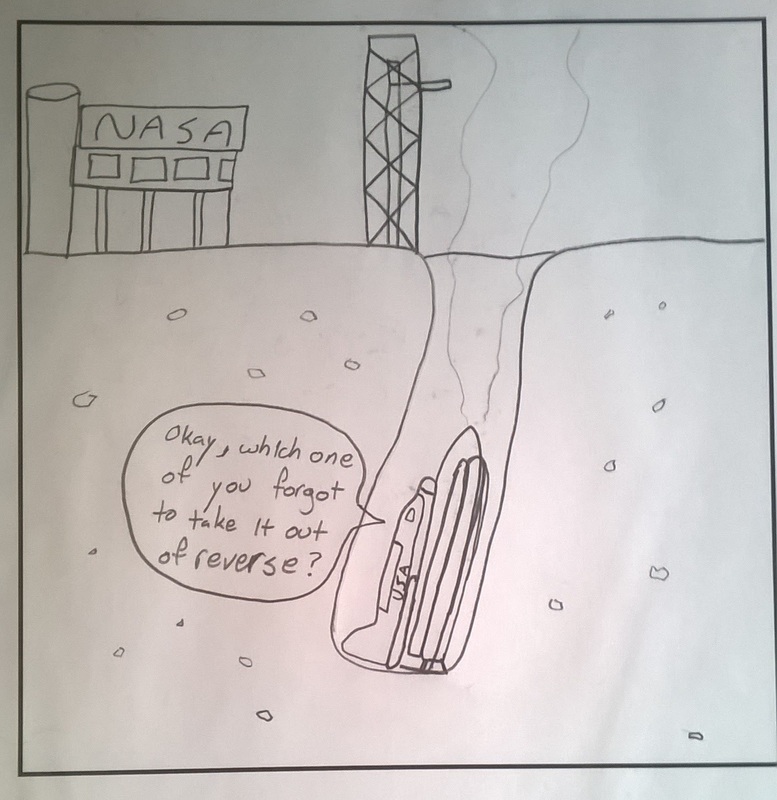 Happened to be up when this posted and got an early idea in. The prompt included a kitchen and a prison guard. Clive gave Briggs the nod and the old man poured tie first gallon of milk down the drain. Clive left Briggs to his sole task for the day to inspect the rest of his kitchen teams’ work. Jackson and Grant carefully set serving trays at each seat in the cafeteria. Wingnut followed, counting out four saltines for each tray. For Clive, today was better than Thanksgiving. At some point, long before he starting serving his own life sentence, they started growing ghost peppers in the prison greenhouse. The warden at the time let the inmates make hot sauce from the incendiary chilies and once a year the guards challenged the inmates to a contest to enduring drop after drop of the condiment. The inmates, used to the hard conditions and harder diets, beat their guards year after year. It was a morale booster for the incarcerated men that didn’t have much else to look forward to outside of the structured life in prison. Clive confirmed that Briggs was nearly done with getting rid of milk. Things would be different this year. He’d found a new way to concentrate the sauce and with his first grandson on the way thought this was the right time for a breakout. Been editing and doing my day job so not much time for Flash Fiction until today. This weeks' prompt was a spy and a beggar with a 200 word limit. What he had been asked to do by his new employer was no longer spying. It was terrorism. Byron stood in the crowded market and rattled the change in his pocket. The metal-on-metal sounded muted in the lead-lined jacket and gloves. The nearby beggar’s cup was an ideal starting point for his polonium-210 infused coins to enter the currency system. The capitalist machine would take over from there and the poisoned money would enter circulation across the country. The ensuing panic would unbalance the nation enough for his new employer to make their move. Spying was deception as an art form. When he’d become disillusioned by his own country’s evolved tactics, the Kremlin sold him on a pure form of spy game. Now they were asking him to conduct this microscopic nuclear strike on soft targets in his own home. Byron collapsed before he recognized he’d been shot in the throat. He looked up to see the beggar standing above him, pulling off his false beard with the hand that wasn’t holding the silenced pistol. Byron considered warning his once partner about the coins that had fallen from his pocket and into the gathering crowd, but he forgot which side he was on. I'm in full on editing mode for my new story collection. 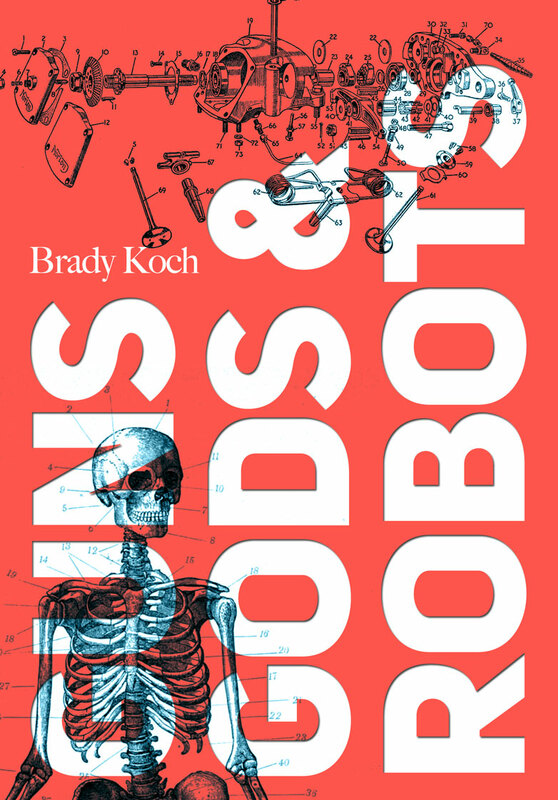 While I'm editing, I've made a draft cover of the book that I'm currently seeking critique for at Cover Critics. Please feel free to join the conversation on the site. Taking a break from editing the anthology for some Flash! Friday. This weeks challenge was to include a janitor and the Colosseum. The laughing of the masses was loud enough to shake the remaining orange hairs on Gratae’s head. The noise intensified when Emperor Partho threw a broom into the arena. The Empresses commanded her gladiator into the field. A year ago, Gratae had been the one answering her orders. One night while cleaning her chambers, she even drunkenly ordered the old man to bed her down. He had been the families’ chief custodian for two generations and would be humiliated to turn down any of their requests. He picked up the broom and sized up the approaching champion. With two steps to go, Gratae broke the broom over his knee and drove the sharp end up into the gladiator’s exposed armpit. The crowd was mute as the next three gladiators advanced. In the moment before they ended him, Gratae stood defiant and pointed the bloody broom at the orange-haired baby in the Empresses’ lap. A final salute from his true father. 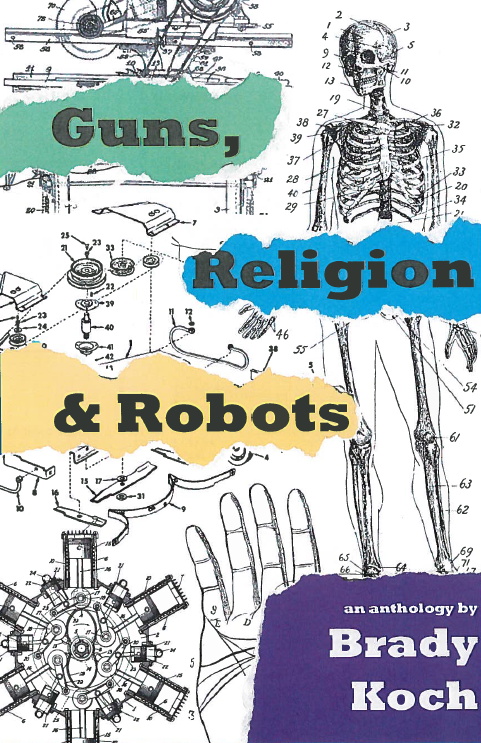 Guns, Religion & Robots - This is my novella anthology that includes revisited Numbers 16:32, Popular Mechanics for Young Widows and new stories that I've been developing over 2014. Knuckle Justice - This is a strange little hybrid novel about karate studio instructor unjustly jailed for crimes he actually did commit. Rad Uncle Zip's Annotated Guide - My contribution to the pop archaeology movement that brought us the Atari ET landfill excavation. More on this soon. Patchwork - This chapter book is complete. I'm just working through the publication process. This is my adventure story about a pair of brothers that are sent a mysterious quilt that traps them in a time and place far away from home. Cartridge Compilation - I writing a variety of short fiction for another site that I'll assemble at the end of the year for online publication.